Segment makes it easy to send your data to Olark (and lots of other destinations). Once you've tracked your data through our open source libraries we'll translate and route your data to Olark in the format they understand. Learn more about how to use Olark with Segment. Our CDN is updated within 5-10 minutes. Then our snippet will start asynchronously loading Olark’s loader0.js onto your page. This means you should remove Olark’s snippet from your page. 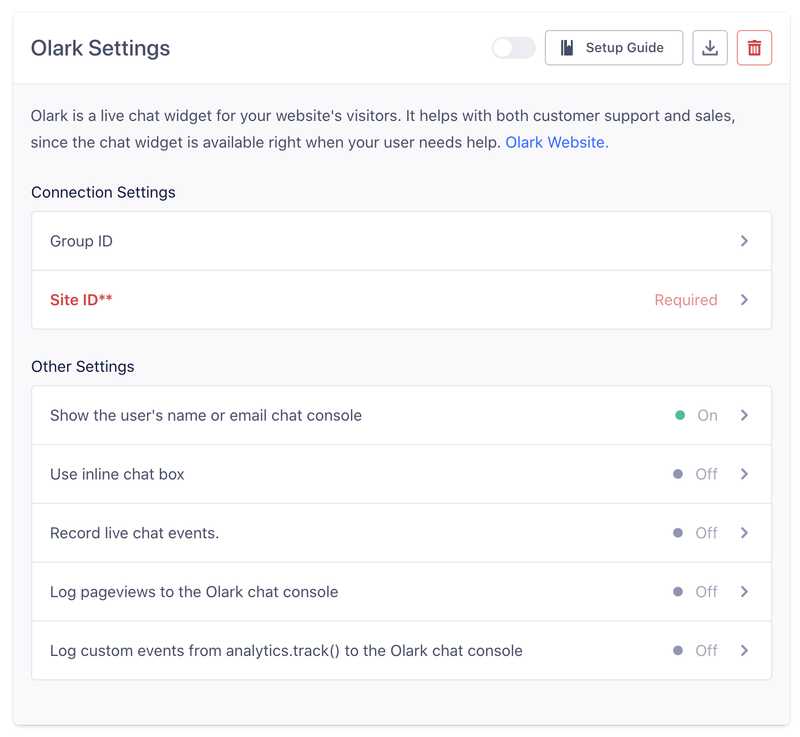 Olark’s chat box will appear on your page, as configured in your Olark account, and you can start chatting with visitors. Olark is only supported on the client side. When you call page, we call Olark’s sendNotificationToOperator function as looking at *url*. You must enable this option with the pageview flag, because it can sometimes be bothersome. We call api.chat.updateVisitorNickname with traits.name and traits.email, or just their traits.name or just their traits.email or their userId. In that order of preference. We call api.visitor.updateEmailAddress with traits.email if you send it, or userId if that’s an email. We call api.visitor.updateFullName with traits.name if you send it, or traits.firstName and traits.lastName appended with a space in between, if you send both first and last name. We call api.visitor.updatePhoneNumber with traits.phone if you send it. We call api.visitor.updateCustomFields with traits. More documentation on the Olark API can be found in Olark’s docs. When you call track or one of its helpers on analytics.js, we call Olark’s sendNotificationToOperator function as visitor triggered *eventName*. You must enable this option with the track flag, because it can sometimes be bothersome. All the settings you can change from your Olark settings pages, like targeted chat and your chat box design, still work exactly the same when Olark is enabled via Segment. These events will be sent to other tools in your stack that can accept track calls, so you can do things like analyze if users who chat spend more money over time. If you want to use Olark across multiple different websites under the same account, create an Olark Group and add the ID here. You can find your Site ID on the Olark Install page. It should look something like this: 9385-174-10-1457.